In the early seventies, Alex Chilton left The Boxtops (The Letter) and partnered up with Chris Bell to form the perfect power-pop band Big Star. Their work was acclaimed by the rock press but commercial success was another story. Cheap Trick had the cartoon appeal to capture the pre-video age imagination of the power-pop audience. Big Star just had tunes. It was ultimately not enough. 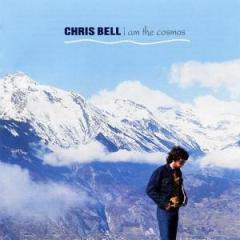 After Big Star’s inevitable demise, a despondent, clinically depressed (some hint closeted) Chris Bell worked at his father’s restaurant, battled Heroin addiction, found Christianity and recorded solo tracks. He joined the fabled “27 club” (rock stars who died at the age of 27) on December 27, 1978 when he crashed his car into a light pole on the way home from work. His solo tracks were assembled into a posthumous album collection titled “I Am The Cosmos”. Though not an album proper, you couldn’t tell by listening. All the album’s tracks carry the same murky sadness and desperation as their tortured creator.